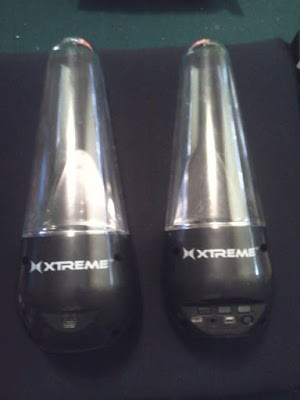 When it comes to speakers, I swear I have seen them all. They are all alike right? Well that's what I thought until I started looking through a bunch on Amazon. There as so many different shapes sizes and they do all sorts of different things. 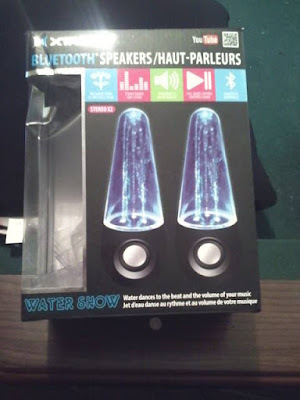 The section I was looking for, was the section on water speakers. 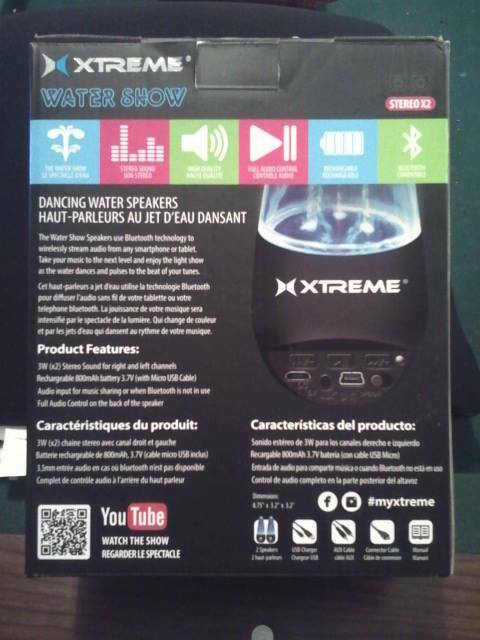 Not the speakers you are thinking of, you know the ones that can get soaked in water and still work. 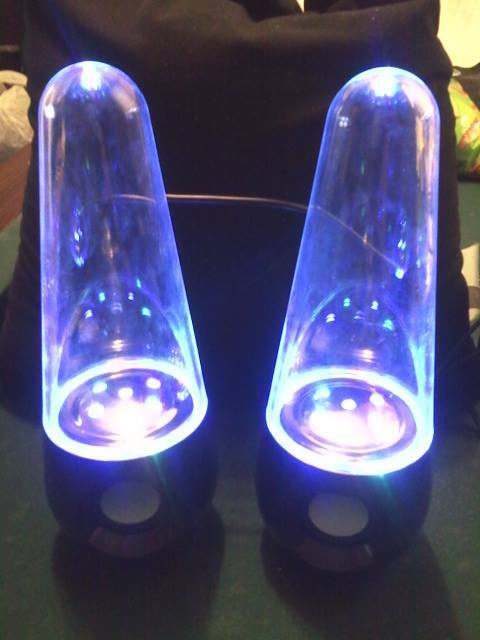 These speakers, are the ones with water on the inside of them. As the music starts, the show begins. These Aura V1 speakers are a delight. They are shaped nicely, so they aren't too big to carry around with you when you are leaving the house. Plus they are super light as well! All the buttons that work this product are located on the back of one of the speakers. Since these are bluetooth speakers, you can use them with devices that include bluetooth. 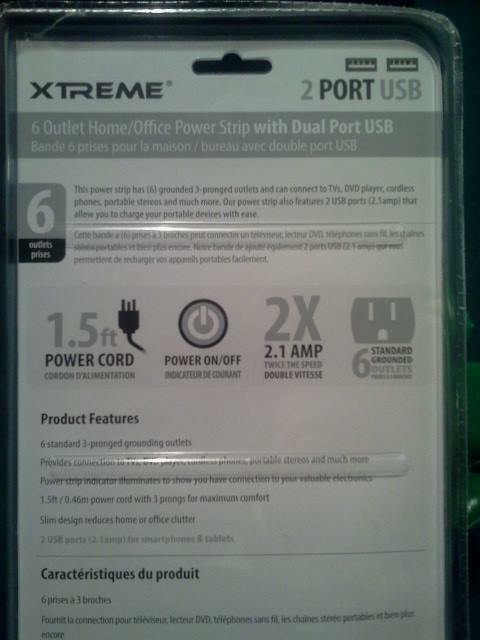 It also includes a stereo cord so you can directly plug it into things to use it. They all plug into the back of the same speaker. 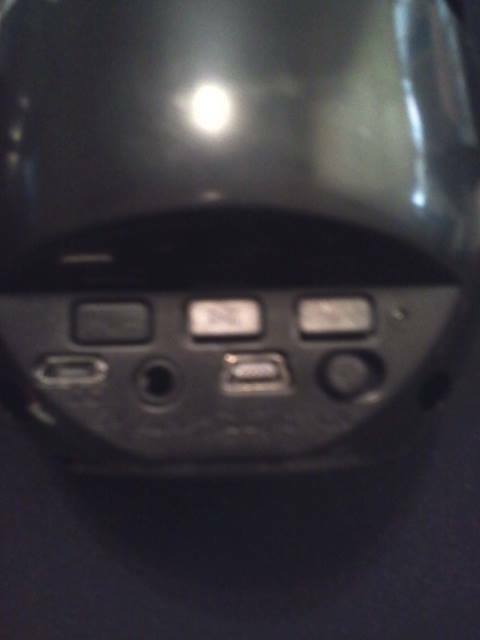 That speaker has a volume buttons, play pause etc. buttons as well. 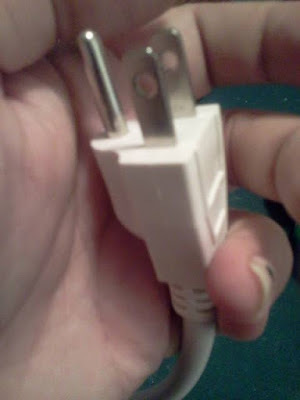 The charger cord that is included, also plugs into the back as well. 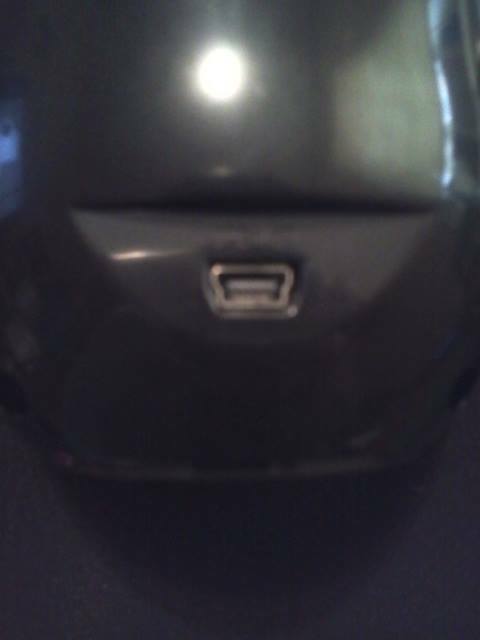 I usually plug it into our x box or my laptop to charge them. The first time took 2 hours. There is a light and it changes when they are done charging. 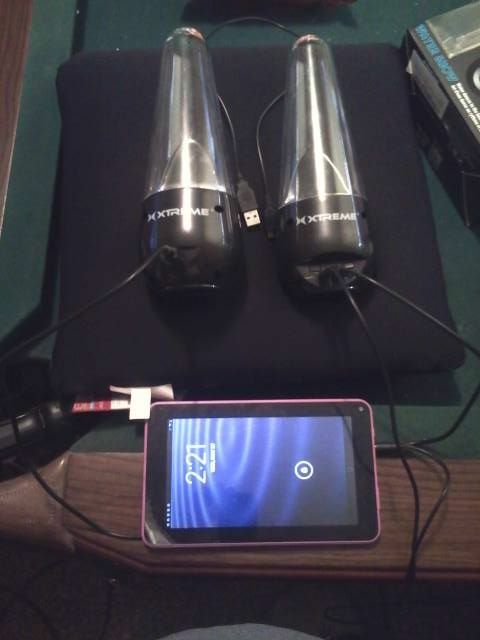 Since then it is so fast to get them charged. When you have them all set up and ready to go, simply hook everything up. There will be a sound when it starts up and the light will come on telling you that it is ready. The simple off and on button on the back, is easy to use and you can tell it is on because the light comes on when they are on as well. 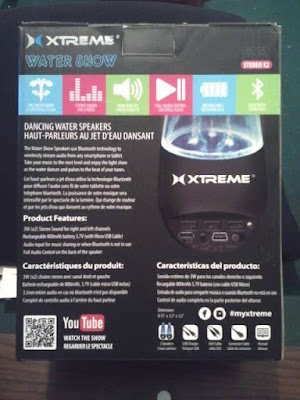 When the music starts to play, if the speakers are charged enough, then the water will start jumping around inside the speakers. It is nice to look at especially in the dark. 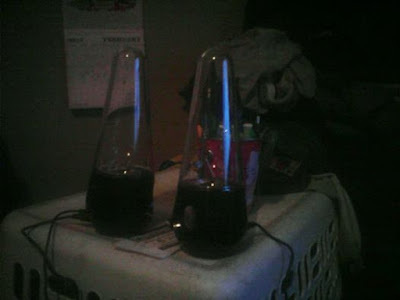 The higher the volume, the better the water jumps around in the speaker. We love watching a movie and having them connected to the tv. Turning the lights out is an amazing experience. You won't find something like this in a movie theater, and it is great for a date night at home with your partner. When these speakers die, they make this weird sound. The water stops jumping, but you can still hear the music through them. Once you hear the sound though, you can plug them into something and still enjoy them as they are charging. We are in love with these speakers. If they sound like something you would like, then head on over to Amazon and check them out by clicking here. From there you can find out more about these speakers, see what other people are saying about them and what they think, and buy a set for yourself! My apartment has very little plug ins in it. The bathroom has 0. 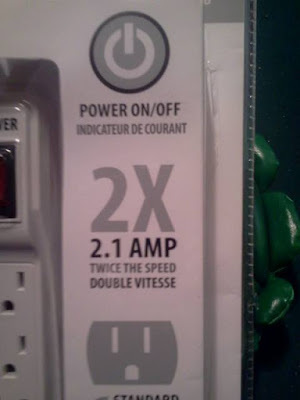 Yes you read that right, 0 outlets. Everywhere else has at least two in them but they don't all work. It is a very old building and the electrical has been changed many times. I don't always have a place to do my hair or charge my phone so I really need a power strip to help me get everything done. 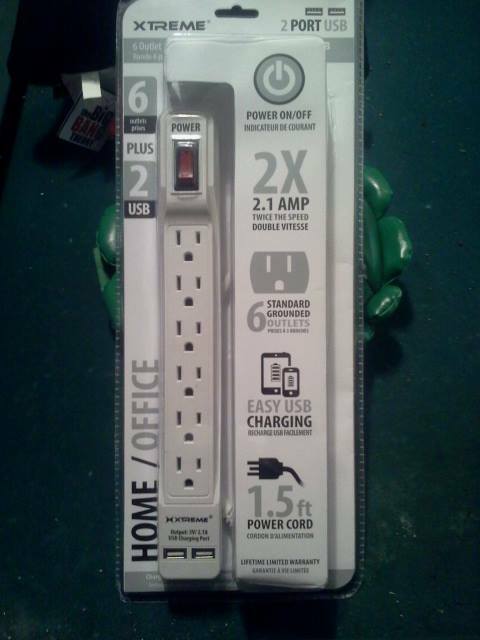 This 6 port grounded outlet, is pretty standard. It is made well and it looks great. 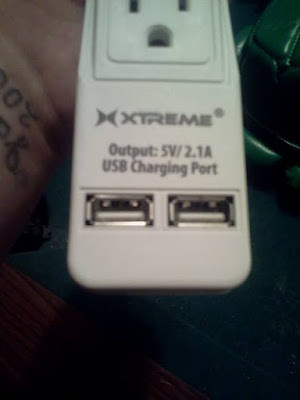 It has 6 ports to charge things into. 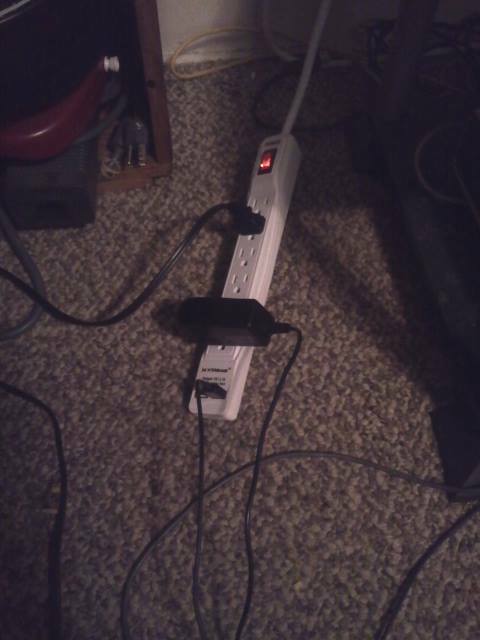 I wouldn't recommend plugging something into every single port at the same time though as that could be a fire hazard. 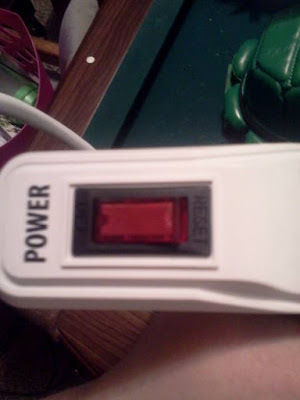 The power button is easy to find and turn on and off. The light is bright enough to be seen so you know whether your strip is on or not. This is pretty standard, but I think it is brighter then the ones that we currently own. As far as power strips go, this one does include two USB ports. 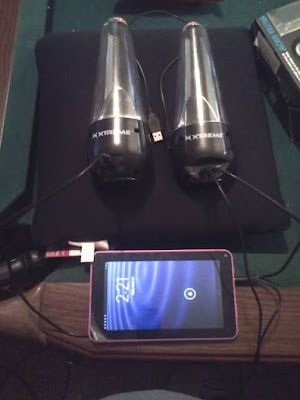 Which is really nice to charge a phone or tablet and you don't have to use a precious outlet to charge them. It also claims that it comes with 2 amps so your stuff will charge faster then ever before. I love how well this charger is made. It is very well put together and of high quality products. You could only break this thing if you are trying to break it and even then it may not be the easiest thing to break. 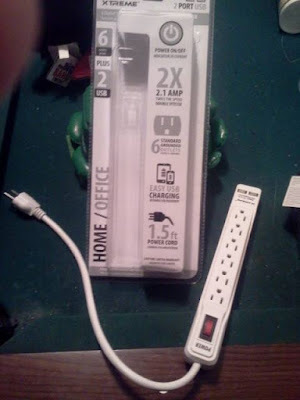 With a 1.5 foot cord, this thing will stick out from the wall pretty far in case you have something that uses a short cord. I wish it was just a tiny bit longer, but it does happen to be longer then the other ones we have around here. We are using this power strip with our x box, Kinect, telephone and my laptop charger. Yes it is a lot to be plugged in at one time, but it is handling it well and like I said don't do that at home, it could cause a fire. 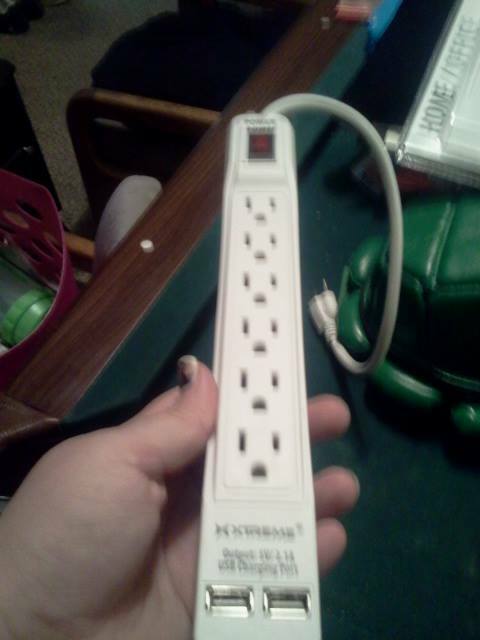 This Power strip is great! Head on over and check it out on Amazon by clicking here. 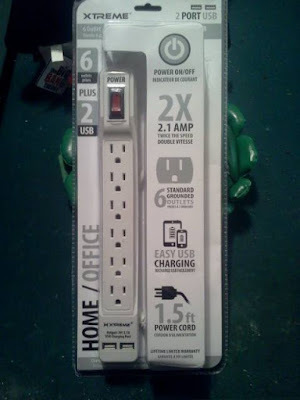 From there you can find out more about this product, see what other people think about it, and buy a power strip for yourself. 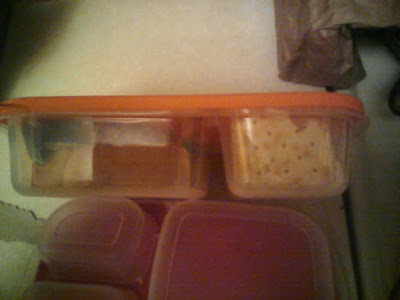 When it comes to lunches for my kids and husband, I am always looking for a way to pack everything that keeps it all how it should be. Ziplock baggies are ok but not great and they cost a lot because they always get thrown away so I have to buy more. 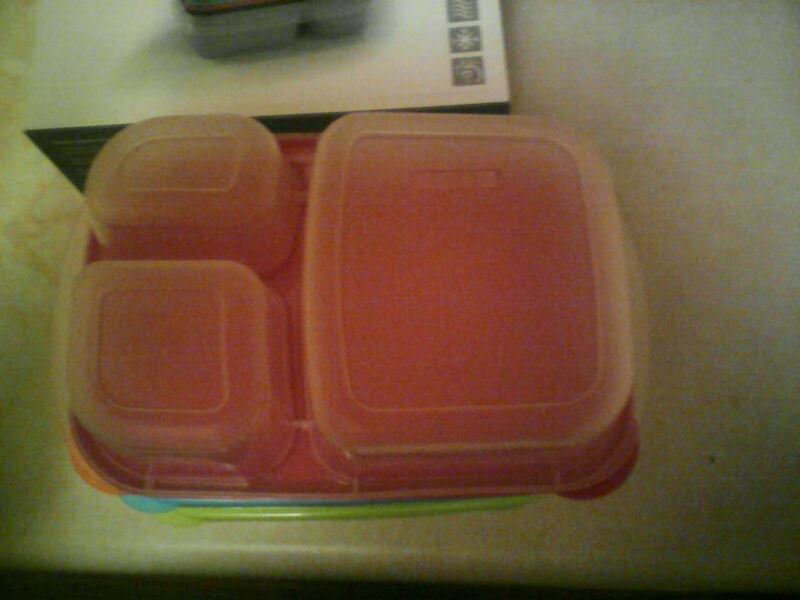 Individual tupperware boxes are way too big for normal lunches boxes and sandwich boxes make it so you can't pack as much. My kids and husband wanted more then what I could give. I needed something I could use for everything but that wouldn't take up all the space in the lunch box. 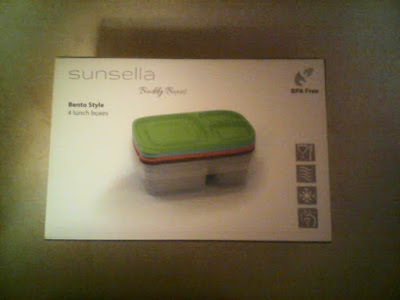 Sunsella Buddy Boxes, are like tupperware but better. 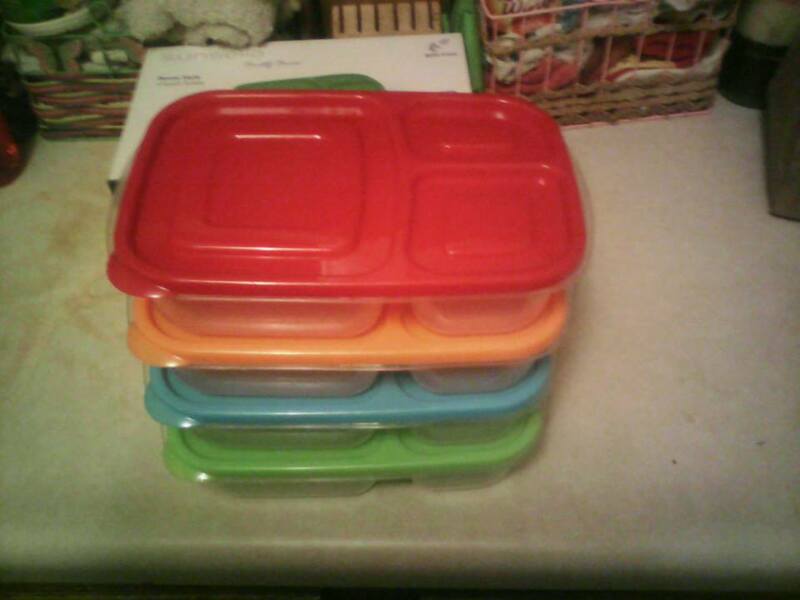 They come with some awesome colored lids. 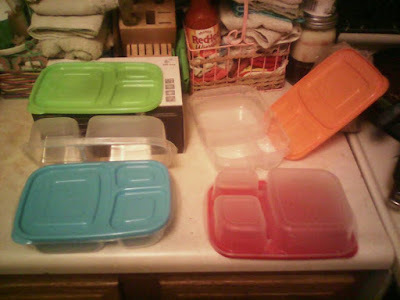 The lids work well and haven't morphed on me yet after repeated uses and after having been in the microwave a few times. Kids don't listen so I am glad they are just fine! 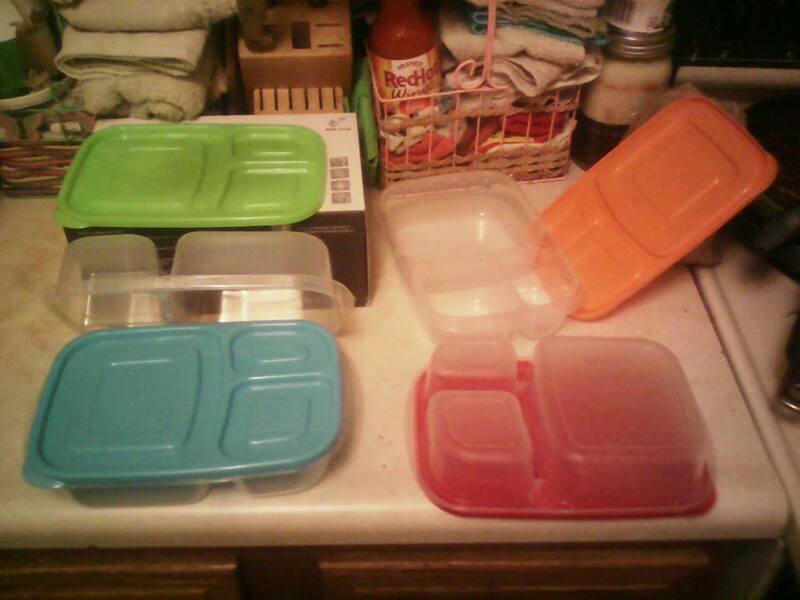 They won't go back in the microwave (the lids that is) as long as I can help it. The pockets on these buddy boxes are deeper then the ones I am use to, which is great. They come with 3 different "compartments" a large one for a sandwich and two little ones for other stuff. 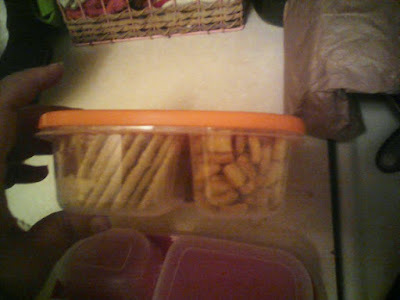 The size is perfect as they are right now, I just wish the two extra compartments were a bit bigger. Once you start putting food in them, they do start to seem bigger! They are made well. 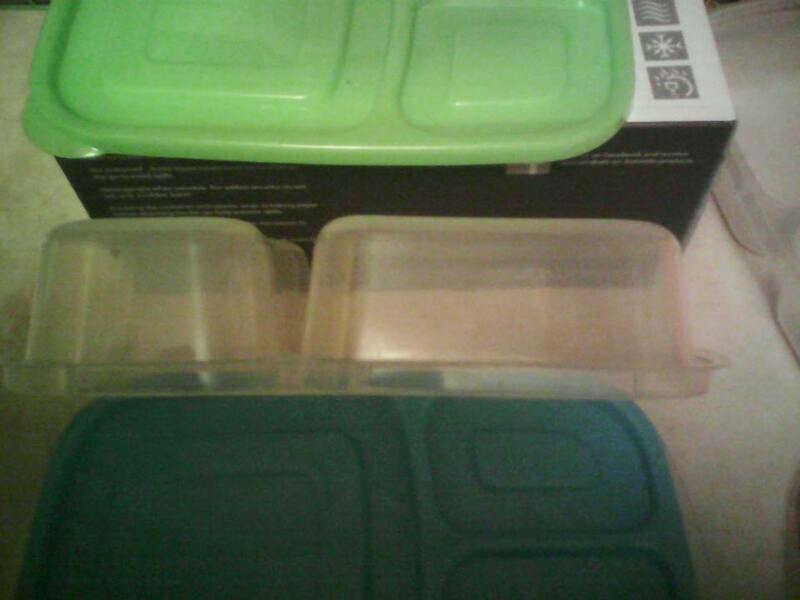 The plastic is a lot thicker on these buddy boxes then the other storage containers or tupperware that I have seen. My family and I love these Buddy Boxes! They can all get them opened and closed on their own. Even though they come off easily, they are still tight on the top and won't fall off. They all chose one color and it's the one they take care of pack up themselves. 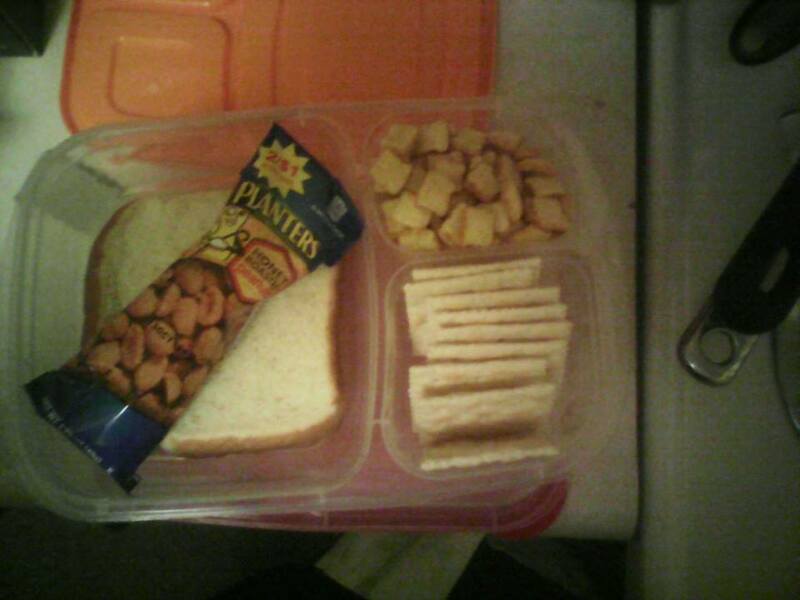 Now there is no more fighting over lunches or lunch boxes, which makes me really happy! When it comes to the clean up, these babies are pretty easy! 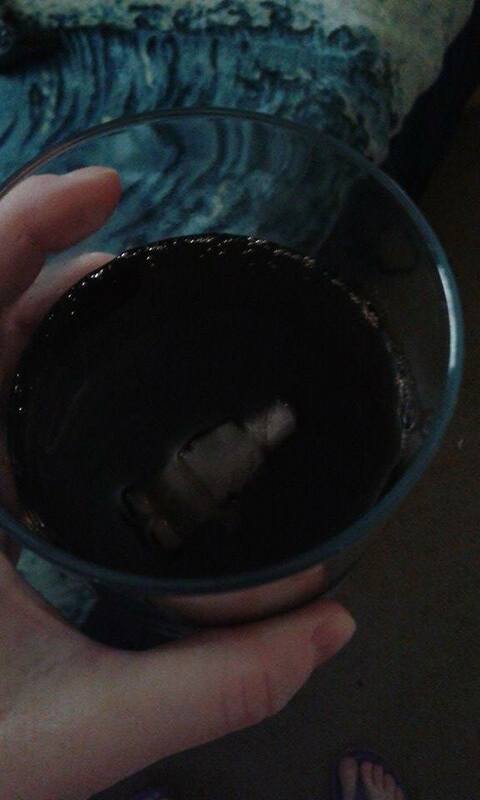 Even after the kids have been at school all day, the stuff rinses right out of there. Of course I am not putting stuff in them that will dry to them...usually! The next time we go on a road trip or a family vacation, these will really come in handy. Especially when they have to eat in the vehicle while it's moving. I am hoping we have no more food spills in the car! Now if only I can figure out something for those pesky drinks! These Buddy Boxes are great. We love them and the kids use them for more then just food. I think everyone needs a set of these. If you need something like this, then these are something you need to check out! Head on over to Amazon by clicking here. From there you can find out more about these Buddy Boxes, see what other people think and what they are saying about them, and buy a set for yourself! Family is important. Finding out what is going to happen in your life, years before it happens is such a beautiful thing but it could also be a very scary thing. If I knew what my life held, I couldn't say that I would be very happy with the knowledge. A lot of good things in life are meant to be found out in the moment and in the right time. This father found out that he was going to have many sons and only a single daughter. The daughter was to have problems that need to be over come. The father knew years in advance and had to live with the knowledge he held inside of him. This book is a true story and it is very well written. I love how the author makes me feel things every step of the way. This book will not only bring up emotions, but it will also teach you things you never knew before! If this sounds like something you would enjoy reading, then head on over to the product page on Amazon by clicking here. From there you can find out more about this book, see what others are saying about it, and buy a copy for yourself! When it comes to my arms, they are just as bad as the rest of me. I have been trying to get in shape for a few months now and have dumped close to 30 pounds. 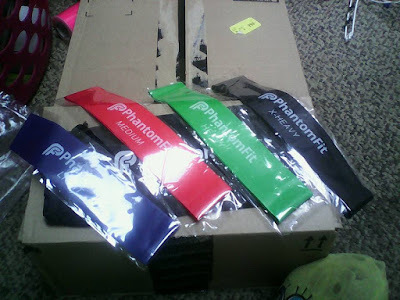 My arms are still a bit flabby though as is the rest of me and I really needed something to help me get them in order. These bands are really well made and they can do what they say they will. They come in light, medium, heavy and extra heavy. I can do well with them up until the heavy and then I start to have problems. I can only do the extra heavy a few times before I have to put it down. I hope to work up to it though. I sit here in front of the tv and just pull them apart. It is so easy for me to get a good arm workout every single day. I never forget to do it because I sit them right beside my chair so every day I see them and want to use them! This is such a good way to get in a good arm workout. If you think they would work for you, then head on over to the website by clicking here. From there you can find out more about them and order a set for yourself! There are so many different types of books out there to read. Some things may not seem interesting, but if you give them a try, you may really love them. Especially when Shakesphere is involved. This book really resonates with females. Or it should at least. It shows just how much we go through as women. Men think we have it super easy, but if they were to read this book, then they would understand us a little better. I love how well this book is written. It is is super easy to reader and not hard to get into at all. This type of book is something I would have never been into until I started reading more books that I would have never read before. The fact that this is an adaption of a Shakesphere, makes it that much more interesting to me. I have always had a thing for poems and adaptions like Romeo and Juliet and the like. I have never seen anyone write on this topic as well as he did so this is a fresh breath of air! If this sounds like something you would enjoy, then head on over to the product page on Amazon by clicking here. From there you can find out more about this book, see what other people think about it, and buy a copy for yourself! I guess I was just like any other kid an enjoyed being read bedtime stories. Back then they were probably all the same ones. I love nursery rhymes and I remember this huge book I had that was filled with them. It was so much fun to be read them and when I was old enough to read them. I still love nursery rhymes to this day and princess stories. I read my kids all the books they want and I even through some of my favorite nursery rhymes into the mix as well! Green Bird is such a cute selection of bedtime stories. It says they are for kids aged 3-6 but my 9 year old enjoyed them very much as well. She likes to read them to her step sister at night. Her and Nevaeh have so much fun before bedtime on the weekends. I often will read to both of them from this book as well. This book is very well written and a joy to read for all ages like I said. The messages are really powerful in this book. I don't give out spoilers but it's pretty cool how the green bird goes on an amazing journey to find relatives that looked like him. The pictures are great, the writing is awesome, and it will make you emotional! Head on over to Amazon and check it out by clicking here. From there you can find out more about this book, see what others think about it, and buy a copy for yourself. Ice always seems so boring. I didn't think there was anything that could make ice cool to me or to my kids. 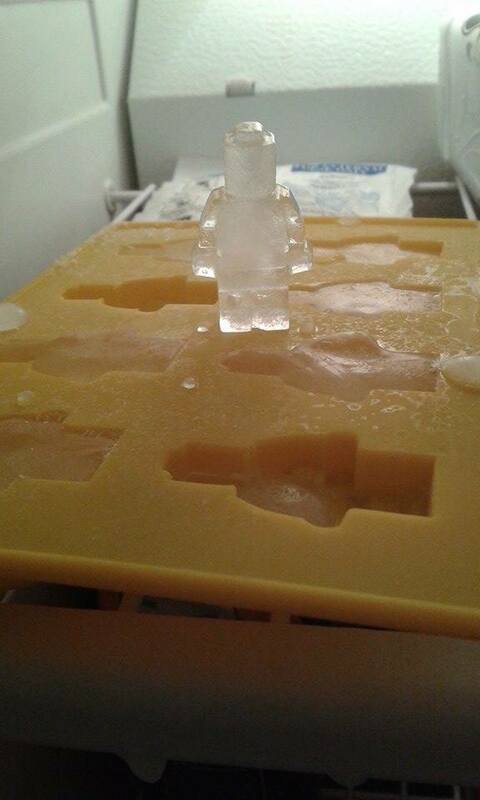 They get so bored with the normal ice cubes that they use. The shapes are so very boring to us, it is almost a shame to use them. I wanted something that they would love and want to use so they didn't have warm or boring drinks. This Lego inspired ice mold, is pretty awesome. Not only can you use it for ice, you can also make other things with it, like crayons, candies, and candles. It is so well made and the pockets on it are pretty deep. 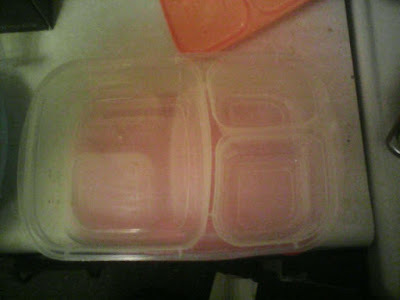 All you have to do is fill them with water after washing it first (on the very first use) then you just stick them in the freezer for a few hours. When you get it out of there, just open them up and pop out the lego men. I haven't had one with a broken leg as of yet so I call that a score. The pockets may seem big, but the lego men look a bit smaller. I wish they were just a bit deeper but the kids are still in love with them. They love the shape and really enjoy how they melt in the drinks as it gets warmer. They can even make these themselves. I think we will try out the different ways we can use this mold. Just so we can enjoy everything it can do. 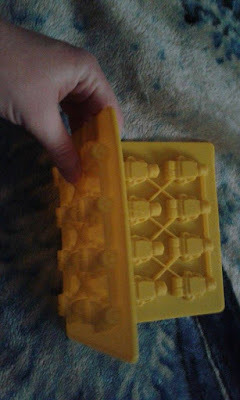 Not sure how well it comes clean so nothing crazy so we can still use it as an ice mold. 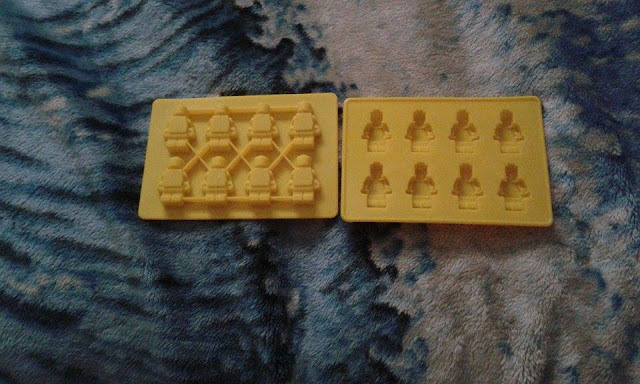 Until we experiment they will enjoy their lego men ice! If your kids would enjoy something like this, then head on over to the product page on Amazon by clicking here. 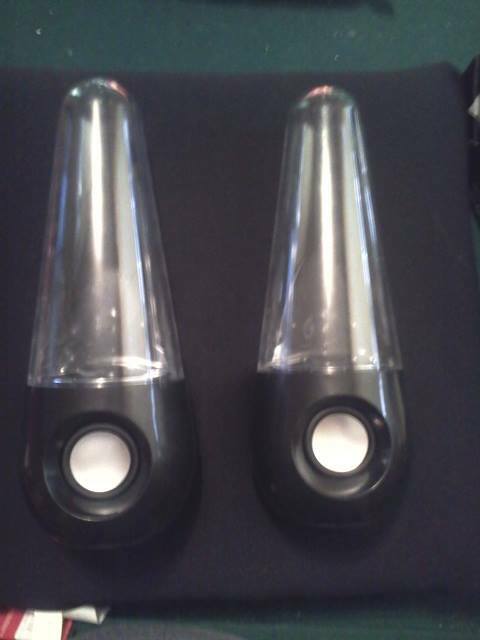 From there you can find out more about the product, see what others are saying about it, and buy a mold for yourself! When you have dolls, one thing that you love, is the fact that you can dress up your dolls in all sorts of fun ways. You can dress them like you or in a way that you would never dress. I remember growing up, I dressed my dolls up in all the dresses and cute clothes that I would never wear. It was so much fun! I never got to paint up their clothes though, I wish I could have! This set is really cool and so much fun. 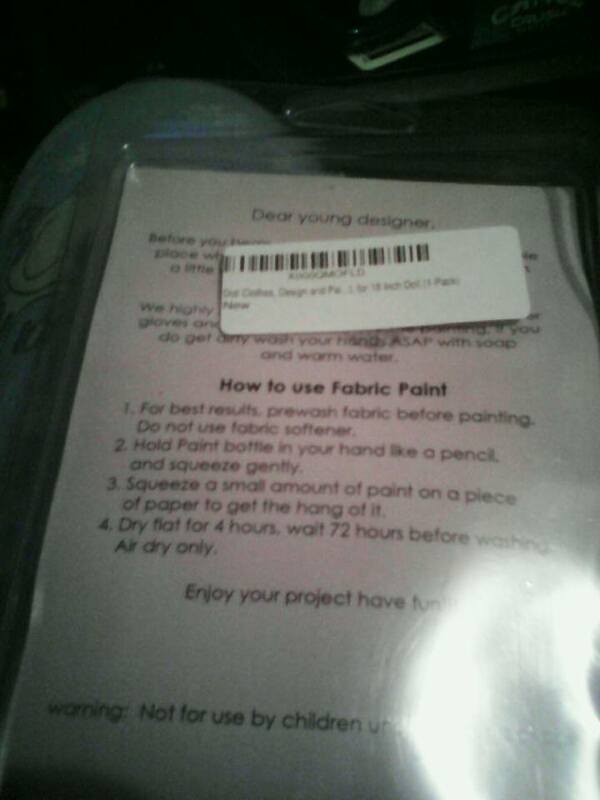 It comes with 3 different paints. 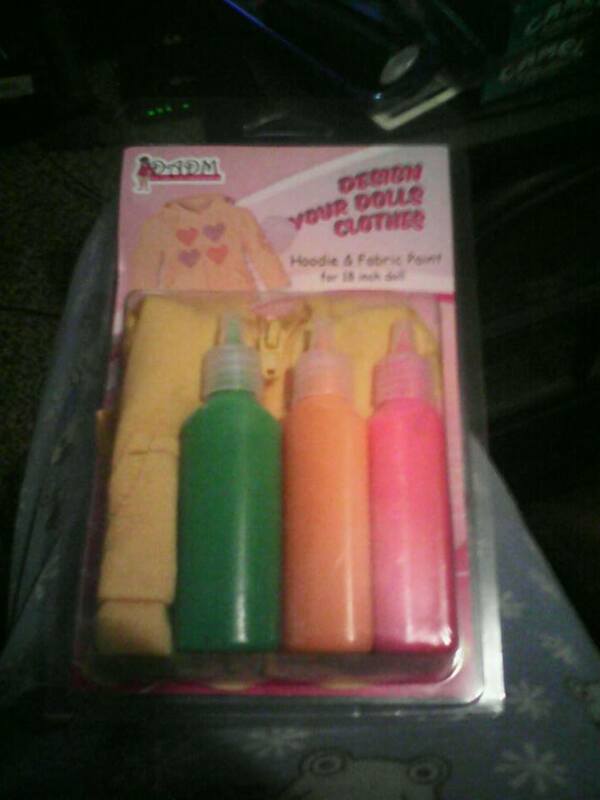 Orange, pink, and green and a yellow hoodie. The hoodie is so nice, it zips up and everything. 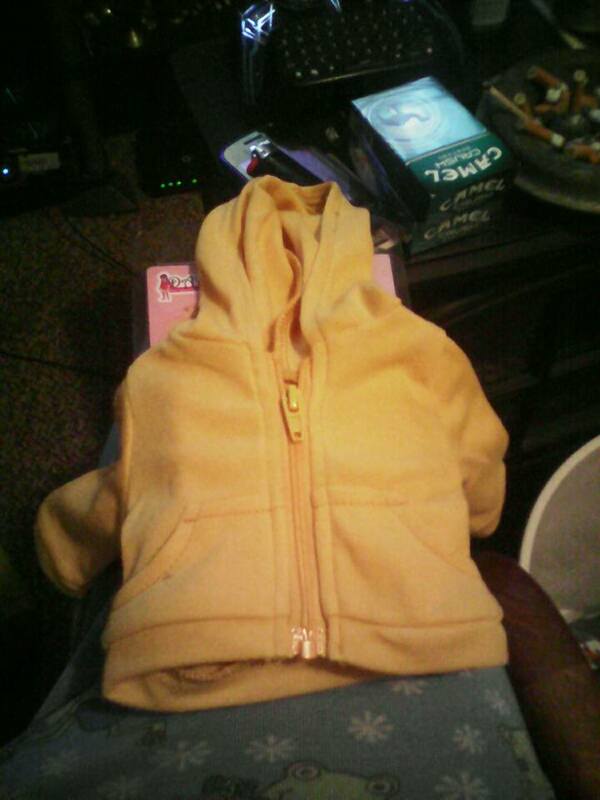 The hood is extra big and the whole thing fits on dolls up to 18 inches. I have to say that the dolls look extra cute with this hoodie on them! My step daughter really loves dolls. Her mom listens to ICP and has her listening to it as well. While I enjoy ICP I don't agree with a child listening to the music, but I knew that what I painted for her would be something she had to love. I chose to do something a bit difficult, a hatchet girl for her. Not sure how to explain it, but if you are a fan of ICP you will get it. When you first use these paints, make sure that you use them on a piece of paper or something else, so you can get the hang of using them. That way when you go to paint the hoodie, you will be great at it and your hoodie will come out looking amazing. There is no limit to the things you can paint on your hoodie either. 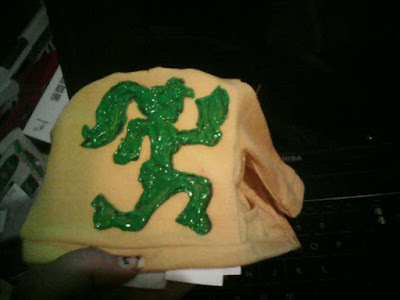 After painting the hatchet girl onto the fabric, I sat it in front of the a.c and left it for about a day. By the time I checked it again, it was dry and ready to be used and played with. I also have to say that I made sure to put cardboard under it, it stuck to the cardboard so I had to sort of peel it off. So always make sure that you have something under neath so nothing gets ruined. This is a great project for you or for your child, just make sure to supervise them so you don't walk in on a mess later on. I absolutely love it and the hoodie is great. My step daughter fell in love with it as well and put it right on her doll when I gave it to her. I had fun making it and she is having fun playing with it on her dolls! 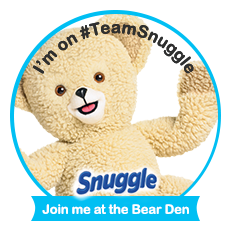 You need to check this out if you have kids or if you have dolls yourself. Head on over to Amazon by clicking here. 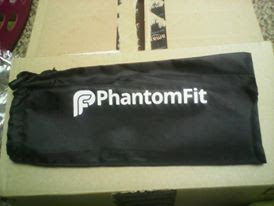 From there, you can find out more about this kit, find out what others are saying about it, and buy a kit for yourself!